NEW PAGE – we are building this now! Want to be included ? 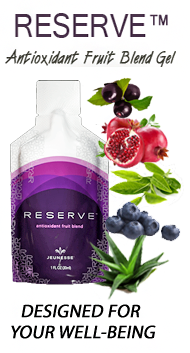 Reserve Fruit Gel Blend by Jeunesse RESERVE Antioxidant Fruit Blend Gel - a Delicious power antioxidant supplement with Resveratrol, Acai, Pomegranate, Green Tea, Grapeseed - supports healthy immune system, cardiovascular function, healthy digestive tract.